“Eat your vegetables!” You probably remember hearing this dreaded saying from your parents when you were a kid. Back then, eating vegetables seemed like the worst chore you could possibly ever encounter. 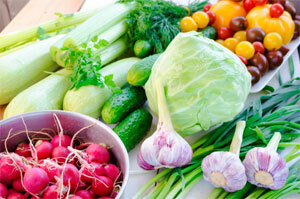 The truth is, vegetables are key essentials to our diet and overall health. Now that we have come to grips that eating vegetables are needed to maintain a healthy lifestyle, does where you get them from really matter? The answer is yes. Organic growers don’t use chemical pesticides, and local growers cut down on the farm’s carbon footprint because their crops travel far less to get to you. Buying locally grown vegetable and other foods create a stronger local economy as well has a healthier community. Let’s face it, we appreciate our food more when it’s fresh and knowing exactly where it came from. While they are many reasons to eat locally grown food, freshness is probably one of the top. Eating local food provides you with a fresher, healthier, and tastier meal. It’s short transit time from farm to plate allows the food to incur less spoilage and lose fewer nutrients. The fresher the produce, the better it tastes, and the more nutrients it supplies to your body. When fruits and vegetables are picked, they instantly lose their optimal nutritional value. Soon after the produce is picked, key vitamins such as C, E, A, and some B begin to decrease. Temperature changes as well as artificial lights and exposure to air can have a significant negative impact on the nutritional value of the crop. The longer food sits, the less nutritious it becomes. Buying local ensures that you are getting the produce at its peak while providing the most nutrients. After experiencing local food, you will find new appreciation for each season’s deliciously fresh food. Eating locally grown food not only benefits the health of a community, but also the economy. The New Economics Foundation in London performed a study which indicated a dollar spent locally generates twice as much income for the local economy. The money spent at food producers and local farms remain in the local economy and create more local jobs. Finding a restaurant that incorporates local food in their dishes can sometimes be difficult. At Salem Cross Inn, eating local and providing the best ingredients in your meals is something we take great pride in. We truly believe that eating locally grown food creates a better community by connecting people to the farmers that provide them with the freshest and healthiest food. With our farm-to-table concept at Salem Cross Inn, our food is prepared fresh each day while incorporating heirloom vegetables, and herbs which are grown in our very own gardens. For more information on eating local food at the Salem Cross Inn, please don’t hesitate to contact us. We would love to answer any questions that you may have.